Continuing the exploration of the world of episodic television in the ongoing series of interviews on screen graphics and fantasy user interfaces, it is my delight to welcome Seth Molson. In the last few years he has worked on “Sanctuary”, “Stargate Universe”, “Continuum”, “Intelligence”, “The Lottery”, “The Tomorrow People” and, most recently, “Dark Matter”. In this interview Seth invites us into the frenetic universe of episodic television, talking about different phases of the productions, keeping up with the pace of interface evolution on the screens around us, the difference between on-set and post-production work, his take on the term “fantasy UIs” and his thoughts on the real-world software tools. 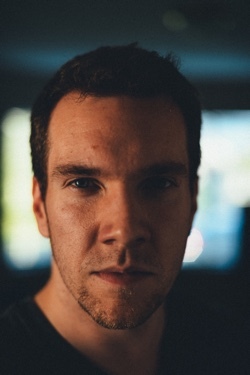 Seth: My name is Seth Molson and I’m a full time FUI designer / Motion Graphics artist working in Vancouver BC. Two of the last six years in the industry have been at SIM Digital in the playback division with a handful of other technical people, and I’m currently the only in house designer at the company. I guess you could say I also play pretty big creative role since I share my ideas directly with production designers and directors, and get a big say in what the content looks like. I grew up in the small ski town of Nelson BC where I studied Multimedia production and design. After receiving a BA in fine arts, I moved to Vancouver with hopes of joining a VFX team. Kirill: What drew you into the industry? If you go back to the time when you just started on your first production (Stargate Universe) and some of the expectations that you had, how close or far has the reality of working in the industry turned out to be? Seth: I originally wanted to be a VFX artist and after graduating university I had the opportunity to intern on Stargate Universe . I mostly spent my internship as a PA, putting up tracking markers and taking camera information from the camera operators. I didn’t really fit into the VFX pipeline because my knowledge was limited and it was a solid team already. I eventually found the playback department where I met Justin Kohse and Lisa Nolan. Justin was a motion designer at the time and Lisa was a 3d generalist who was transitioning out of playback. I think it was a mixture of luck and persistence, but I ended up joining the team full time for Season 2. The expectations were nearly impossible, but that’s what makes these environments so incredible; the teamwork and talent allows for anything to be created. There was a steep learning curve which I’m thankful for. Ultra-map for “The Tomorrow People”. Courtesy of Seth Molson. Seth: When I worked freelance I would jump from production to production and pitch ideas in the pre-production/prep phase. It all depends on what is being asked for. A lot of what I create has to look realistic and simulate a real environment in the film/tv world. 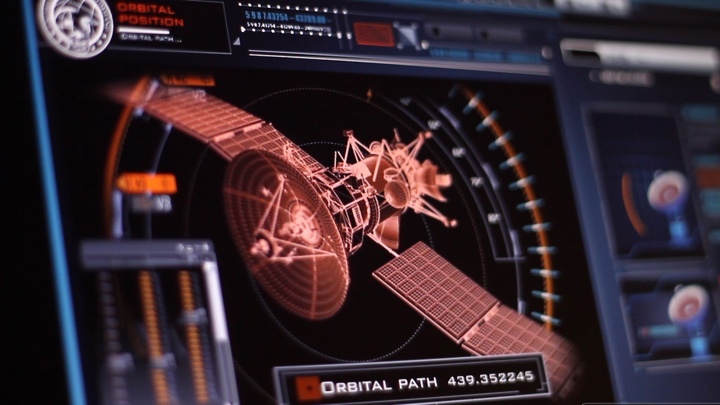 I would say that 70% of my job is a real world UI look and the other 30% is science fiction. When I get to work on science fiction content, I sit down with the directors and Production designers and hash out a look based on references and drawings of the sets and artistic look of the production. In most cases (knock on wood) my ideas make it through to the final cut but the frustrating part is that not everything makes it in front of the camera. I can spend a week working on a set and only 5/10 screens actually get seen in the shots. I usually concept in Illustrator because it’s faster for me than sketching on paper. The only time I will sketch is if I’m in a meeting with a director and he/she has many ideas of how a potentially big build is going to go. I will frantically scribble it all in to try and get their thoughts out on paper. Screens for demo “SIM Shuttle” ship created for an open day at the studio. Courtesy of Seth Molson. Kirill: It feels that with so many screens around us in our daily lives, it’s hard to imagine a story set in the present or near future without screens. How do you push the envelope of portraying the technology on the screen when there are so many advances that people see in their everyday lives? Seth: This is a tough one, especially with all the current movies out right now where the UI is really pushing the envelop. 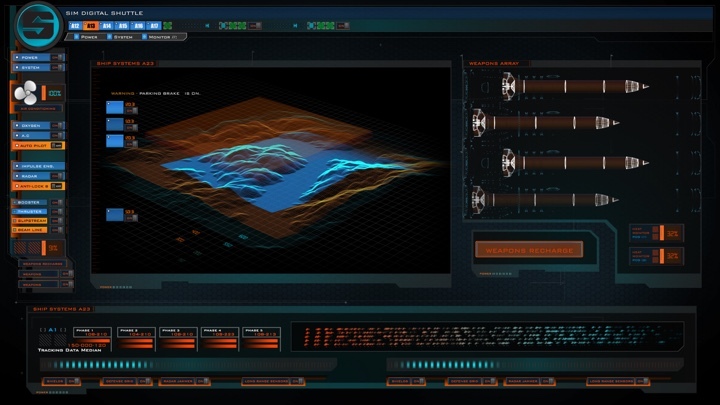 I try and make something unique or use colors that aren’t normally seen in FUI / UI . Sometimes it goes and sometimes it doesn’t. Last year on “The lottery” I decided to use bright orange as the basis for desktop folders and icons and they loved it. Technology is advancing at an incredible rate and I recently looked back at my work from 2 years ago and thought it looked horrible. Styles keep changing and there will always be a dynamic flow to design. 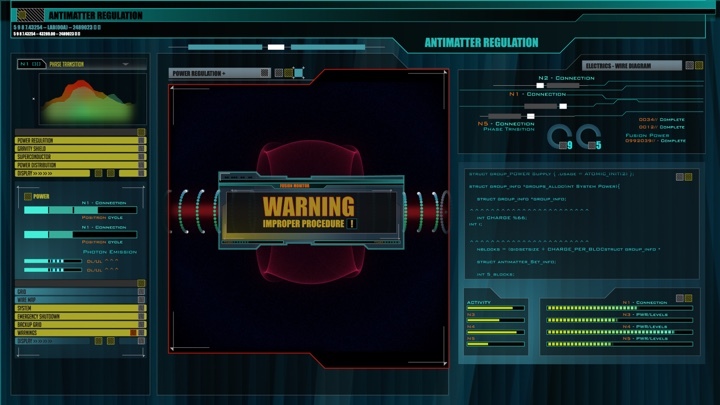 Anti-matter warning screen for “Continuum”. Courtesy of Seth Molson. Kirill: How compressed do things get once they start shooting the season episodes? How much time do you have to work on a single episode and how much recurring / new work do you do across the season arc? Seth: The episodic tv schedule is madness. Every episode has a 7 day shooting schedule, and while shooting is happening, those 7 days also are used to prep the next episode so there are no breaks between episodes. The bulk of the show’s look is designed in pre-production / episode 1 and then from there on out, the stopwatch doesn’t stop. sometimes I have a day or 2 to create an entire set of 6-8 screens. Other times they are blocking a scene and the director wants changes so have 20 minutes to make changes and have it back on set ready to shoot. When new sets are introduced throughout the season, new content is created. 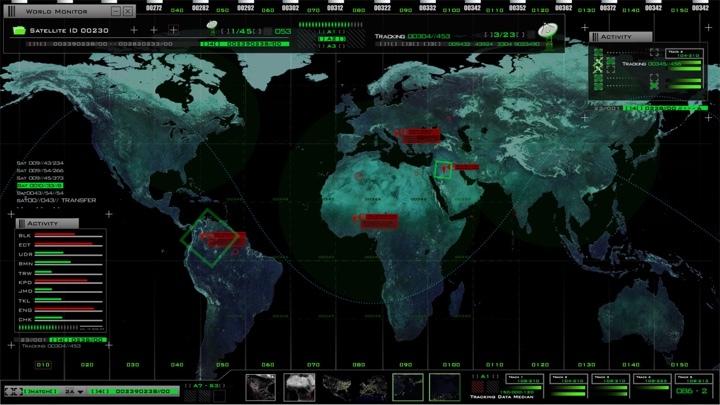 Main LaRoche control screen for “Continuum”. Courtesy of Seth Molson. Kirill: Is it expected to see some kind of evolution of the digital tools that are being “used” in the universe of the specific show? How do you evolve the screens throughout that same storyline arc of a season? Seth: A good example of how tools are evolving within the story universe is when touch screen devices started getting popular. Suddenly shows wanted everything to be touch interactive to give more of a high tech feel. Tablets, wall consoles, even some desktop monitors now need this ability for actors to touch and interact. Kirill: Is there place for post-production work, or are you mostly involved in on-set sequences? What would you consider to be advantages and shortcomings of on-set work, especially in the hectic world of episodic television? Seth: Designing for post production is much funner in the sense that there are no hardware or software constraints. I can make something as visually pleasing as I want without having to make sure the cue points are programmed properly. Live playback on the other hand, is designed in a way where it must be interactive and hit each cue in the timeline of events. Actors are looking at the finished design in front of them rather than a green screen. The upside to this is that it makes the environment more believable and helps actors to stay in character. Being on set in general is exciting, yet stressful because the limited amount of time to get the shots done. 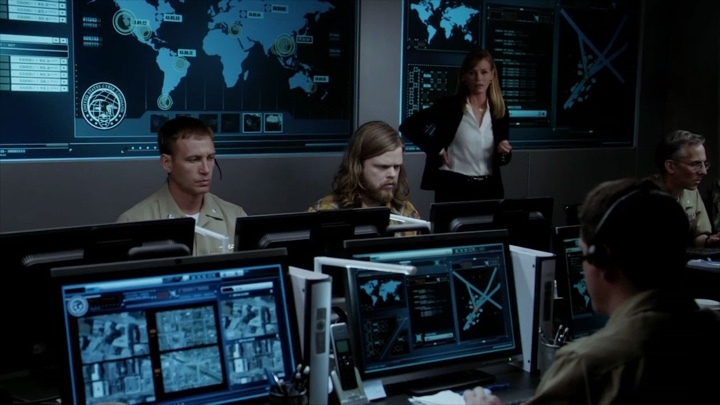 Control room on “Intelligence”. Courtesy of Seth Molson. Seth: This is always impossible and most people don’t understand. (to be fair, I didn’t understand until the first day I started) I usually just say I’m a designer… but if curiosity persists, I say I create fake user interfaces for film and tv. Kirill: You currently “define” yourself as “UI Designer / Motion Graphics Artist”, but I think that it used to be “Playback Artist” in the past for you. Are these just labels as the scope of what you do changes and shifts between various productions? 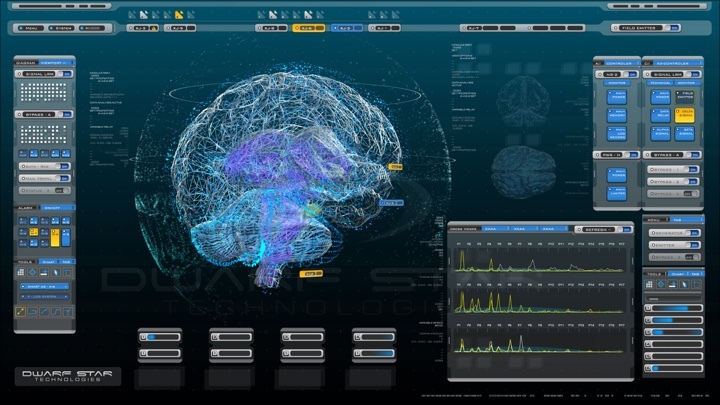 Rendering of satellite on “Intelligence”. Courtesy of Seth Molson. Kirill: If we talk about the term FUI, which started as Fantasy UIs and is sometimes referred to as Fictitious UIs or Faux UIs. Do you think that it captures what you do? Seth: I think the term FUI mostly captures the science fiction portion. Mark Coleran came up with the term to depict new and unique technology within the story. 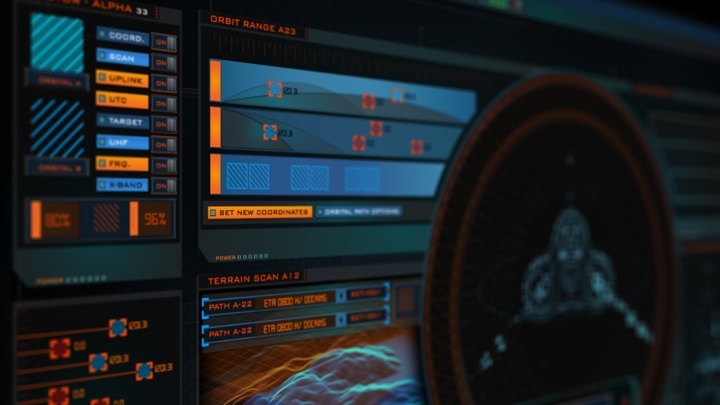 A lot of my work has to resemble real life, believable UI like Mac or PC for instance, which isn’t really classified as FUI… or is it? either way I think it mostly captures what I do. Seth: The main story point – “Hero graphic” will take up most of the design and the rest will be filled in with smaller bits and pieces relating to it. Some directors want lots happening with everything moving, and others want less as it gets distracting. I guess over the years I have found a balance but it’s always changing. 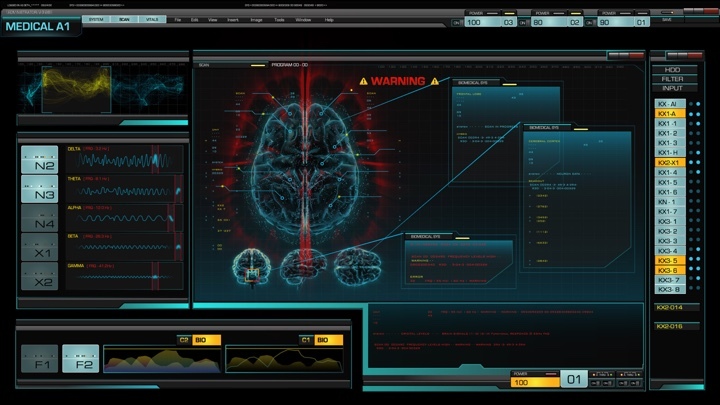 Brain scan warning on “Dark Matter”. Courtesy of Seth Molson. Seth: I sometimes worry, but that’s based on the idea that I don’t particularly like my older work. I see it and worry, but then I remember it’s only for a make believe setting anyway… so it’s not really a big deal. Kirill: You sit down to binge-watch the latest season you’ve been on, and you’ve worked on it for a long time and you know pretty much everything that’s happening. Do you get to still enjoy the final product? Seth: I don’t get to see how it was shot till the very end so I definitely still enjoy binge watching shows I’ve worked on, when there’s time. Kirill: And on the same subject, are you able to enjoy other sci-fi productions that you haven’t been involved with, in TV or feature film, without getting “distracted”, so to speak, every time a flashy computer screen pops into the frame? Seth: I get pretty distracted by other work, especially when it’s really well done. I try and break it down in my head and miss parts of the movie. There are a lot of talented people out there. 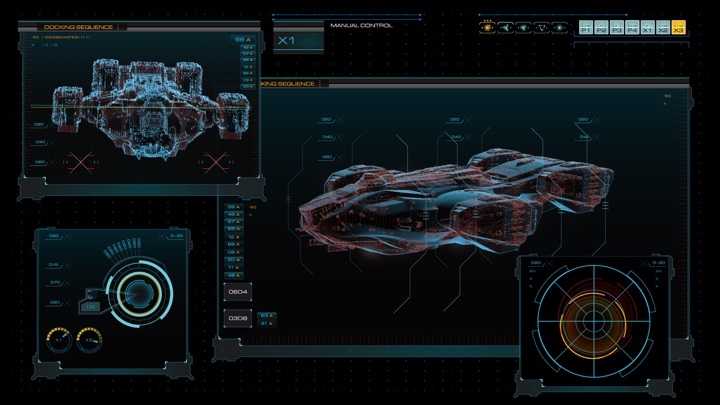 Docking screen on “Dark Matter”. Courtesy of Seth Molson. Kirill: Stepping back into the world of real life software for the last few questions, what are the tools that you’re using? What are your main pain points? Seth: The programs I use every day are After effects, Illustrator, and flash. I love the way illustrator and flash work together and keep everything vector. When the graphics demand is higher and more resource heavy, I use Director to compile everything. Cinema 4D is next and I am still fairly new to using it. It’s integration with after effects makes life easy though. 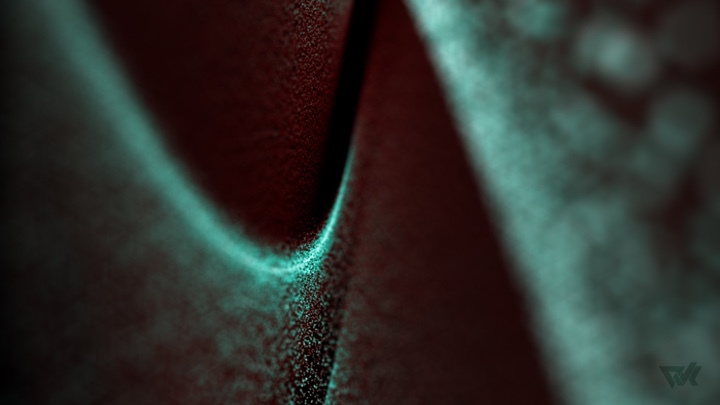 My background in 3D comes from lightwave, so anyone who has used it will understand how ancient and backwards it feels. Lately I’ve been generating graphics for use in VJ software and the live mixing/manipulating capabilities are endless. Kirill: What can be made better in the way we communicate and interact with computers and screens around us? Seth: I think in the real world, software companies should focus on making their products work better instead of releasing a new version as fast as possible before the competitor does. Also, stop changing features just for the sake of change. Leave things how are are and improve how they work. I’m mostly talking about the software tools we use, like operating systems. 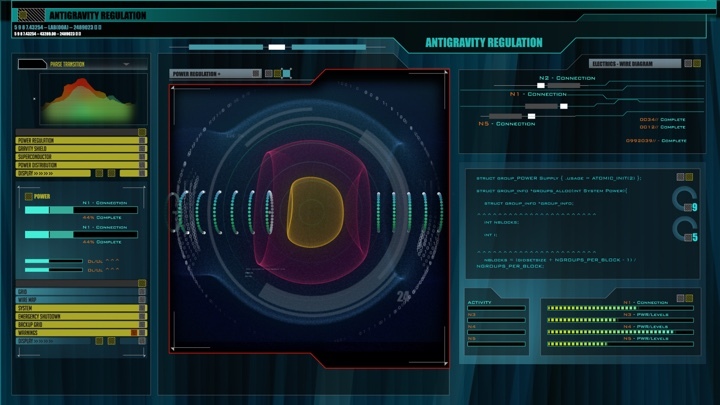 High-tech lab screen on “Dark Matter”. Courtesy of Seth Molson. Seth: Can’t wait for this technology to make its way to the mainstream. It will change the way we watch movies, game, and do regular every day tasks. I tried the Oculus while attending F5 conference in New York and it blew me away. If we can watch 360 degree movies in the near future, I’ll be the first in line. Kirill: What’s next for Seth Molson? Seth: I think I will always be in the industry for interactive design, one way or another. As of lately I’ve started exploring the world of VJing and would love to try it out. Big projectors and custom stage designs sound fun, as well as interactive art displays at festivals and galleries. As long as people can interact with what I make, I’ll be having fun. Particle twist for a VJ set. Courtesy of Seth Molson. And here I’d like to thank Seth Molson for graciously agreeing to answer a few questions I had about the art and craft of screen graphics and user interfaces for episodic television, and for sharing background materials. You can see more of Seth’s work at his main site and on Behance. You can also find him on Twitter. Stay tuned for more screen graphics interviews in 2016!